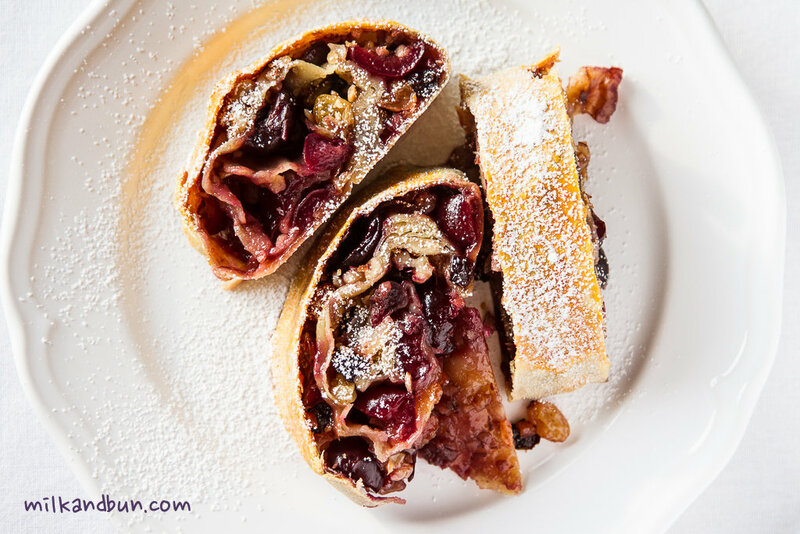 Do you know, that first strudel recipe is dating back to 1696; strudel legend says that the Austrian Emperor’s chef was perfectionist, he even made an order that strudel pastry should be so thin that you could read a love letter through it! The pastry. Sift flour on to a clean surface, add salt, and make a well in the middle. Slightly beat an egg with water and butter, add the mixture into flour. Knead the dough for 10 minutes, time to time punch it down and throw until it becomes elastic and smooth. Wrap it in clingfilm and leave it at room temperature for 30 minutes. Preheat the oven 200C/400F. Line the baking tray with baking paper, grease it with some melted butter or oil. The filling. In a cup or small bowl, put all washed raisins and cover with cognac; soak for 15 minutes, then pour out remaining cognac. Cut cherries into halves, you may keep some whole. The pastry. Dust a workspace with flour and roll out the pastry into rectangle as thinly as possible. You can place wet and floured tea-towel, and do it on it. When you can’t roll the pastry any more, begin stretching it using your hands – place back side of your hands under the pastry and stretch it. Keep on going until it is very thin or you can see pattern of the tea-towle through it. Brush the rolled dough with melted butter. Sprinkle with crushed almonds, leave en edge 3cm uncovered. If using breadcrumbs, brown them in some butter until golden-brown. Spread cherries, and sprinkle with sugar. Adjust amount of sugar, depending on your taste. Scatter raisins and remaining nuts on top. Fold uncovered edges in, then roll up the pastry into a sausage shape. Gently put the strudel on the baking tray, brush with melted butter. Bake for 35-45 minutes until the pastry is golden. Allow to cool slightly before serving, dust with icing sugar. Serve while it’s still warm with vanilla ice cream or sauce. For the vanilla sauce, in a medium pan warm 125ml milk and vanilla bean (don’t allow to boil); add 1 beaten egg yolk along with 1Tbsp caster sugar and 1 tsp cornmeal into pan; stirring constantly, cook on a medium heat for 9-12 minutes, until the sauce thickens a bit. Let it slightly cool and serve with strudel. Jul25July 25, 2014 • By milkandbun • This entry was posted in Desserts and tagged baking, blog, Blogging, cherry, cherry strudel, cooking, dessert, DIY, food, food and recipes, food photography, food styling, foodpress, homemade, My Life, nuts, pastry, photo, photography, recipe, recipes, Russian, strudel, sweet, vanilla sauce. Bookmark the permalink. Mila, this sounds wonderful and you make it seem so easy! I also love the glimpses into your life at home. Happy Fiesta Friday! Thank you, Selma! It is really not too tricky 🙂 Have a lovely weekend! This looks sooooo good. What a great way to use all of the wonderful seasonal cherries! Yum. 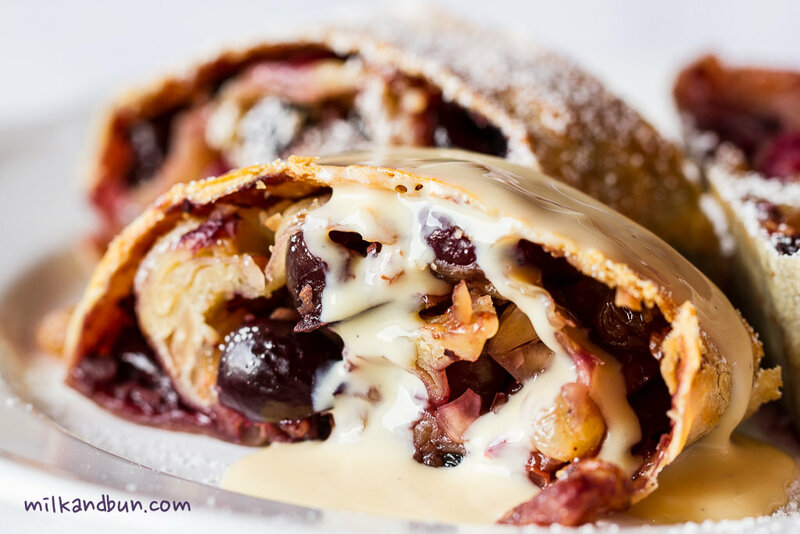 Oh wow I love your strudel, looks amazing and I really love that you used cherries, great change from apples. Beautifully done. Must ask, was your dough so thin you could read through it?Looks delicate and thin to me. Looks delicious, love all the fresh cherries, dried fruit and nuts in it, thanks for sharing! Strudel! I want some! Like now! Awesome job, thank you for sharing this recipe with us, your photos are beautiful. Happy Fiesta Friday! Mila, This is an absolutely gorgeous sturdel. I love the cherries, nuts, raisins…You are a talented lady! It’s a pleasure to get a compliment from you, Fae! Thanks a lot! The strudel looks amazing, Mila! Thanks for sharing it! It is absolutely delicious! 🙂 Thanks for the warm comment, Linda! Wow!! 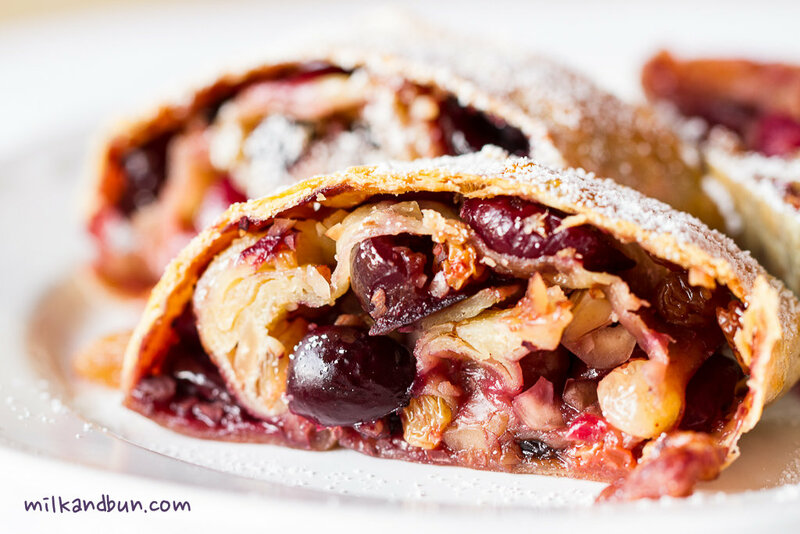 I am in love this strudel.. its looks so so delicious. . Full of nuts and cherries. . Yumm!! Cant wait to give it a try! ! It is the point of strudel – loads of filling and very thin pastry! 🙂 Thanks for coming! I love the idea of putting a vanilla sauce on this strudel! Wow, you made strudel pastry! That is amazing, and it turned out perfectly. What an awesome dessert to bring to FF, thank you for another wonderful post!! I so love it that you made your own pastry rather than buying filo. Not so sure I’ll ever be so innovative, but it’s inspired me to think about it! Happy FF. C’mon, give it a try! 🙂 this pastry is easy to prepare, it doesn’t require much time and the result is fantastic! Totally agree, sweety! Thanks for the comment! 😄you are 3 hours behind Dubai, right? You still have time for a bite! I also love cherries; unfortunately, they are overpriced here most of the time.